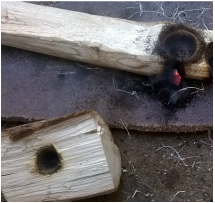 I recommend learning the Bow Drill as an introduction into Friction Fire and then to explore and experiment with different woods and cordage, before moving onto other friction methods. The drill is twisted into the bow cord and secured between the hearth board (at the bottom) and the bearing block (at the top.) The pointed end of the drill fits into a hole in the bearing block and the blunt end onto the hearth board, close to the edge of the board (facing you.) Downward pressure is applied on the bearing block. I keep the setup secure by placing my foot on the hearth board and securing my arm which is holding the bearing block tightly against my shin (or knee) as shown. The bow is steadily moved backwards and forwards starting slow then increasing in speed, making the drill rotate and rub against the hearth board causing friction. A "pie slice" notch is cut in the burnt depression being formed by the drill on the hearth board, where a small pile of black charred dust collects underneath onto the ember tray. The dust (hopefully!) becomes so hot that it eventually ignites and begins to smoulder, this ember is then added to the tinder and blown until it bursts into flames! ​See below for more information on the principles and see Method for step by step instructions of using the Bow Drill. Note on Measurements: I don't measure, and do it by eye - but I have included measurements for reference! G) A piece of leather to go underneath the hearth board - this is my addition to keep the hearth board free of any debris/long grass and useful if ground is damp. I also use it to wrap the kit up in. A good sharp solid bush craft knife with sheaf (not a folding knife), and a sharpening stone. A small hatchet may be useful for larger pieces of wood. 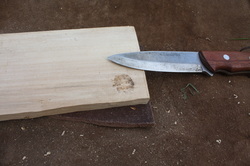 A good solid piece of wood (baton) for batoning the knife\hatchet into the wood to help make the hearth board. 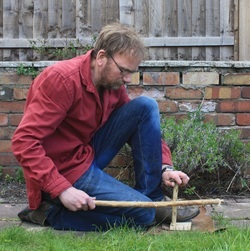 A small saw for sawing wood to correct length - I use a small folding saw. I started with a one from the supermarket, which cost about £4 and did last a couple of years. I now use an Opinel 18 which I prefer as it has a wooden handle. Ivy, Hazel and Willow in various states of seasoning. It is widely cited that the best type of wood is medium-hardness - you should be able to make an indent with your fingernail. Too soft and it will just disintegrate, too hard and you get polishing and not much dust - but some hard woods do work, they may just need a bit more preparation and a lot more downward pressure. The wood needs to be dead and dry, but not too dead and it's best to look for dead standing wood - wood starting to go spongy will not work! Wood found dead and dry may act differently to wood which has been cut whilst "green" and then seasoned. I don't cut green wood for use in the bow drill, unless it has already been cut by someone else for another reason (e.g. hazel coppicing etc) - you will need to let "green wood" season if it's for use in the drill or hearthboard. A selection of drills and hearth boards. Hazel on Ivy and Willow on Ivy - finding dead ivy which is large enough for the hearth board can be challenging as you need a mature ivy! Look for fallen mature trees which may have an ivy attached to it! It also needs to be dried out well, and best if you take the bark off and carve it into hearthboards before drying and store in a dry place. Ash on Ash - though Ash seems to work against itself and is not the easiest. Hazel on Ash works far easier. Hazel on English Oak - same as below. I've also tried Field Maple (with itself and Hazel) but not yet had success with it - I'll try again once seasoned a bit longer. I find hazel to be perfect for the drill as it is common in the UK, works on various woods, usually grows straight, can easily be found in the desired thickness and needs little work. Willow is also good for similar reasons but is not as easily available as hazel in my local area. Pine on Pine (Scots Pine is the only native Pine in the UK.) I have successfully used Hazel on non-native Pine which worked really well. I've also seen Alder and Beech mentioned - I found Beech to be too hard and polishes very easily, I've not yet tried Alder. Cherry Laurel (naturalised in UK) on Ivy. Caution: Cherry Laurel leaves&fruits are cyanogenic. I was testing to see if Laurel on Ivy works as used by the Ancient Greeks but Cherry Laurel is not actually related to Meditarranean Bay Laurel. Spruce on Spruce - works well and even when still on green side. This is a good use for left over Christmas trees! Mediterranean Bay Laurel on Ivy (as used by Ancient Greeks - Theophrastrus ( c. 371 – c. 287 BC) writes about Bay on Laurel in "The Enquiry into Plants." Contrary to some advice, you can use different wood combinations, and when using the same wood combination, it does not have to be sourced from the same tree\branch. There are many more combinations than above. I'm always on the look out for potential materials and trying new combinations, so once you've learnt the Bow Drill and are confident then it is good to experiment with different woods (and techniques) rather than sticking to one. Cut a section of wood at least 15cm/6in (I have used shorter) in length and at least 4cm wide. The main advantage of a bigger board is that you can tempt more embers out of it, without having to keep making a new board! Preferably with few knots. cut the chosen wood into a small log (6 inches to 1 foot) section. 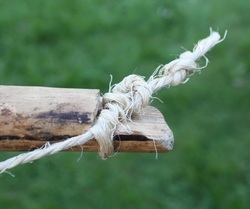 Stand the log on one end, and using a bushcraft knife or small hatchet, baton off one side, then the next. I recommend to carve Ivy and Clematis with a small hand axe as they don't split straight. It is preferred to carve both sides flat so it resembles a plank - it doesn't have to be perfect (it's easier if it lies flat on the ground. ) I prefer it to be no more than 2cm thick, ideally about 15mm. If it's too thick the dust has more time to cool, too thin and you may wear through it too quickly. Using a knife, you will need to make a small indentation which you can place the thick end of the drill into, to get started so the drill doesn't slip around. I prefer the edge of the drill to be upto about 5mm away from the edge of the hearth board. The notch in the hearth board will be made, once you have started to drill into the wood and started to form a burnt depression - this will be explained in the "Method" section. There are also notchless methods as well. The drill needs to be as perfectly straight as possible and again as knot free as possible. I prefer to look for wood that is the right thickness, rather than carve them down. I mostly strip the bark off (but you don't have to if it is smooth and snag free.) Carve if needed to smooth off any bumps/notches which the cord could snag on. Carve one end (symmetrically) pointed and the other end blunt and slightly rounded off at the edge. My drills are usually about 2cm in thickness. Some people say the drill should be 15 to 18 cm (6 to 7 inches) long but I prefer mine to be longer (25cm\10in) and I find it works just as well, and easier when learning. The bottom of the drill should be blunt to increase the surface area to cause as much friction as possible. The top of the drill needs to be as friction free as possible, hence why it is tapered to a point. Also, I find with the drill that there is a fine balance with the deadness, you need the wood to be hard and not brittle (otherwise you may find the sharp end disintegrate quickly.) Saying that though, I have produced embers out of willow which I thought may have been a bit too green - so experiment! The bearing block is to hold the drill in place, at the top and allow it to spin freely with little friction. Most articles I read, suggested to use a very hard (ideally green) wood e.g. Holly. I had a lot of trouble with my bearing block which prevented me from being successful, as I had too much friction at the top. My first successful bearing block was actually a Limpet shell which I held in place with a piece of leather (as it got hot!) The limpet shell worked really well as it was smooth inside, conical shaped and so there wasn't much friction but they get hot and over time the drill will break through the shell. I now tend to use a stone with ideally a small natural hole\indentation in the middle - it may take a while to find the perfect one! When learning, you could always drill a small hole. You don't need a large hole, just enough to stop the drill slipping around. Bone and antler can also be used. The bearing block needs to be large enough to hold comfortably in your hand, without your fingers getting in the way of the drill. Some people lubricate the hole in the bearing block e.g. Bee's wax (I've also seen "ear wax" mentioned!) With the wood bearing block you do want to try and polish the spindle point and bearing block hole so try to bed it in by not applying too much pressure at first. General consensus seems to be that the bow should be as long as your arm pit to your hand. The longer the bow then the more spins per stoke are achieved - each time you change stroke the drill will temporarily stop to reverse so the longer the bow the better. However, you are restricted by the reach of your arm hence why it is suggested to use a bow the length of your arm, otherwise a longer boow will be unyiedly and they you won''t be able to use the whole length anyway. Smaller bows can work too - you just get less spins of the drill per stroke - I've used smaller bows but it is easier with an arm length bow. The type of wood doesn't really matter but some people prefer woods like Willow. You can either use a springy bow or a solid bow. A solid bow will require a bit more adjustment of the cord to get the tension right. With a flexible bow, you don't need as muuch sllack and can use the flex of the bow (by bending it) to twist the cord around and the flex of the bow will then tighten the cord. I have mostly used a bow which is fairly solid and only has a slight curve (see above) but I have used flexible bows as well and they do work well. However, if the bow is too thin it may snap under the pressure of the tightened cord. My bow is a couple of cm in diameter. With natural cordage you may find a bow with a bit of flex works better . I started with a sturdy bow when learning - mine works well with natural cordage. I use a simple notch (see picture ) at each end, to attach the cord or if the branch has twigs coming off it you can use them to tie the cord. I have seen others split each end in half, and others drill a hole (that needs a drill though!) There are various ways of doing it. It's what you find best, for you. When I learnt I used lawnmower starter cord, as that seemed to be a common recommendation for learning, however I now recommend natural 5mm Flax Linen cordage (you can buy it off ebay.) Flax linen is strong and doesn't stretch as much as other natural cords, and I have successfully taught many people using this type of cord. Cords which stretch or fray will lose tension which will then make the drill slip - a flexy bow may help against this. You may want to try some natural cords which are commercially available first before making your own cordage - I started making my own cordage in 2016 and have successfully made nettle cordage (two ply, 10 strands per ply.) You may need to slightly adapt your technique with weaker natural cords, and you may find that you need to replace natural cordage more regularly - my nettle cordage does last well for several embers. ​For commercially available natural cords - I've had success with Flax, Sisal (with just 2 loops) and Leather and Jute (using multiple twists method - explained further below.) Flax is now my favourite. Sisal is very dry and frays quickly and doesn't last that long. For making your own cords, there are various natural materials from which you could make the cord, such as, buckskin, rawhide, sinew and also plant fibres (e.g. roots, bark (e.g. lime), plant stalks like nettles and flax.) There are various articles on the internet explaining how to make natural cordage. This is a very good article for making nettle cordage. ﻿When stringing a solid bow, the cord needs to be slightly longer than the bow so that it can be twisted around the drill (I typically twist at least 2 times ) and is taut when the drill is vertical. You may need to adjust the cord until it is just right. Start with the cord one and a half times the length - cut off any excess so it doesn't get in the way. With a flexible bow, you can use a shorter length - a little longer than the length of the bow. Jute cord wrapped multiple times around drill. With the "Egyptian" method, you can use lots more cord and you wrap the cord multiple times around the drill (at least 8), and you don't need the cord as tight. This helps prevent the slipping cord issue. You can also use thinner cords with this method, as there is less pressure on the cord. I've successfully used household string, a thin leather cord and Jute cord using this method - both easily fray and snap using the 1 or 2 twist method. There are various ways to attach the cord to the bow - I use a simple method of tying a knot in the end and twisting the cord in a loop so it is easy to adjust the length as seen in this photo. Also see this site for an alternative method. Ideally, you need to attach the string so it is easy to adjust the length. The way you attach the cord, may also depend on the material used (again experiment with what works best for you.) Experimentation is the key with the bow drill! With natural cordage you may find slipping and fraying cordage an issue, especially since natural cordage can be dry. Some people rub tree resin\bees wax into the cord. I've not found this to be an issue with Flax cord. I place a leaf or piece of bark or even a small piece of leather underneath the notch in the hearth board to collect the dust\ember. You can also use a thin piece of wood or paper/cardboard. The tinder needs to be dead, bone dry and combustible! My favourite is either dead dry long grass (it needs to be dead when gathered; hay won't work very well) or dead bone dry bracken with dried fluffy Rosebay Willowherb seed heads in the middle (there is debate whether willowherb is native but it is very common, thistle down also works.). The Willowherb seeds extend the ember - I also include the throngs (dried) which will also ignite. I form a tinder nest with the bracken/grass and place the seedheads in the middle. I don't skimp on my tinder and make a nice size bundle. Late summer is the best time to collect your tinder, and I usually collect a large bag of it to last through the year since you can't always rely on finding dry tinder in the UK! There are other materials which work well such as Honeysuckle and Clematis bark which can be buffed into a fibrous tinder bundle. I also like to make a good sized bundle, if you have enough material why skimp! Rosebay Willowherb - very common throughout the UK countryside. Picture on the left shows it in flower, and on the right shows the fluffy seed heads and throngs. Now you have all the components, you are ready to start using it! See the Method page for a step by step guide. Also see this blogpost article "A Year of Bow Drill Experimenting" going into more detail about various alternative techniques. finding and sourcing the matching wood combinations of drill and hearth board: hazel and ivy was my first success. the cord - string broke too easily; other cords were too stretchy. Flax cord is now my recommendation for learning. a solid bow - I couldn't keep the tautness of the cord on the drill with bendy bows; and my early bows had a tendency of snapping under pressure. I then settled on a nice solid bow with a slight curve, which I still use. However, flexy and bendy bows have their advantages and can work. connecting the drill to the cord - I found that with one loop\twist, the drill kept slipping so I went for 2 which worked a lot better. I have also used the Egyptian method with thinner cord which wraps the cord multiple times around the drill and works well. tinder - since I was also learning about starting fires with tinder, this took a few experiments too! When I had got to the point where I could create an ember, I found that I couldn't light the tinder! My preference for a tinder nest is bone dry dead grass or bone dry dead bracken, with fluffy willowherb seed heads inside to extend the ember. and of course knowing how to build a fire and keep a fire lit helps! all of that took a while to come together!